Got this in the middle of battle. I didn't take a screenshot, but the exact same thing happened to me earlier today. i am also experiencing Crashes beginning of battle Crashes since last patch i removed all Mods even did a clean install!!!! wth, its really annoying the hell out of me. anyone having this problem ? 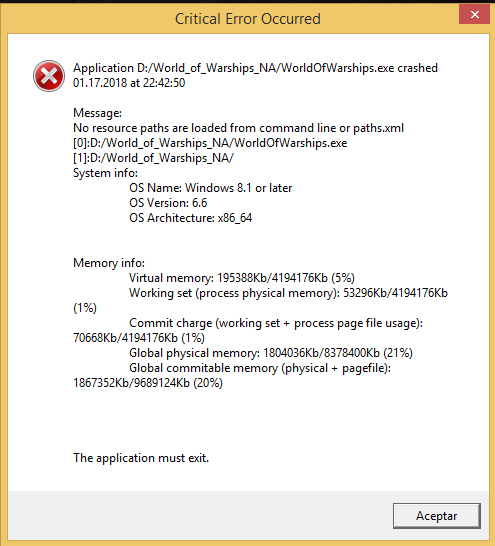 I am having the exact issue as described, with the Critical Error pop up appearing any time I try to launch Wows. Before this started I was getting fairly numerous spontaneous reboots at the end of battles. 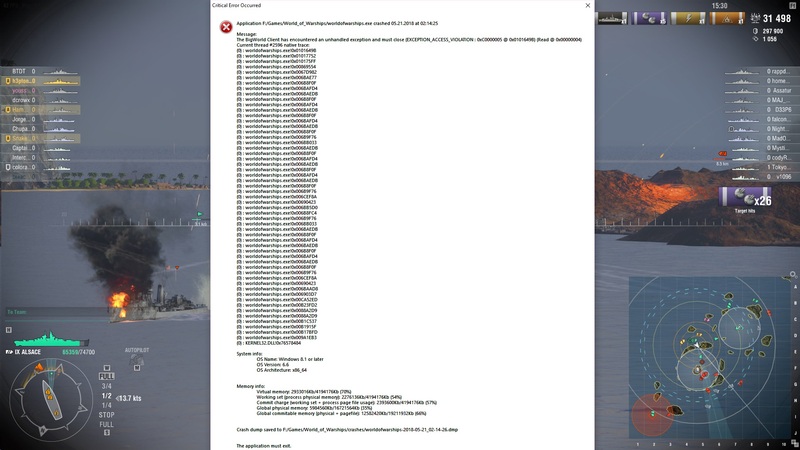 The last time it did that, I tried to load Wows up again and it said I was already in a session. Then the critical errors have been ever since. Have done numerous reinstalls to no effect. I did create a ticket at WG support. All drivers are updated (AMD R9 390x). If anyone has any suggestions please advise. 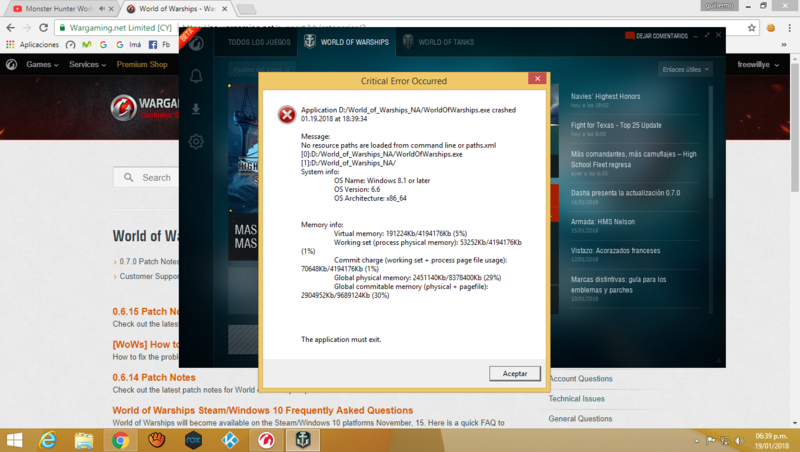 I had WoWS saved on a secondary drive E. When I had Steam install it on the main drive (C) it started to work again. In some of the above images it also appears the games are loaded on a slave drive, so this may help. Another angle is to use the Steam version of the game if you didn't already have it; or conversely download it straight from the wargaming site if you had Steam. Only a guess but the problem seems to be the original install location file was somehow corrupted and when reinstalling at the same location the corruption was not being eliminated. This happened to me a few days ago as well. I tried to run a repair on the game, but I ended up having to uninstall and do a clean install. 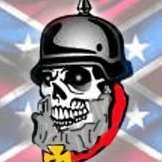 That fixed the error problem, as well as a problem that I was having with the voice overs not working correctly and a couple of other issues. So my question is, when are you going to fix this wide spread problem?? Spent a ton of money in this game and cant play it without crashing and later getting critical errors. This new update, does it include a fix for this or just more ships for people to spend money on this broken game? Same. Happened to me on Sat at the very beginning of a co-op battle. Froze my PC. I had to restart. I couldn’t get back in. I had successfully participated in a number of battles previously. I lost flags and was reported for being AFK. I have also noticed that the first battle that I play is very slow to load. Well,I got this critical error every day while playing. It started 01.04.2018. and since then, usually 1 crash in gaming session,every time. It gets really annoying but most annoying and sad things is that WG support is useless. I described the issue, I attach crash files ,etc. I also mentioned that 100% same issue happening from times I didn't get any external files in my game folder (I got Aslains now). Yes, since last update I crash at least once per game, and have to quickly load back into a ranked game and hope I wasnt sunk before I finish. Getting VERY frustrating lately. 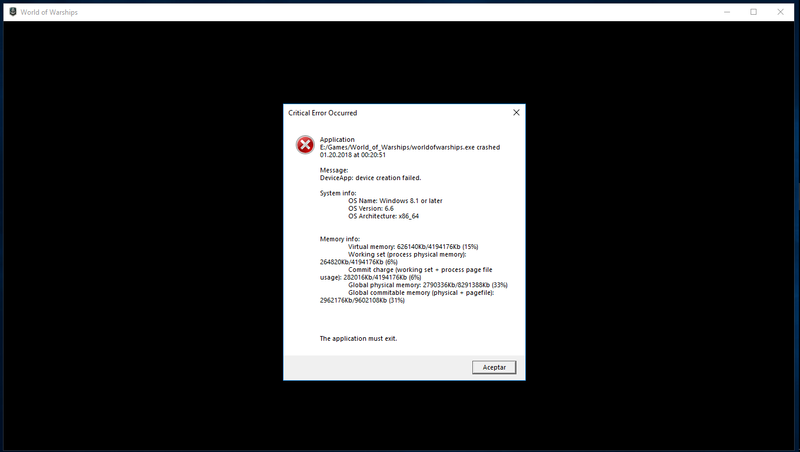 Game never crashed before, now almost each and every game. I tried re-installing the game, video, audio drivers, etc. No difference. Disabled this and that, no difference. 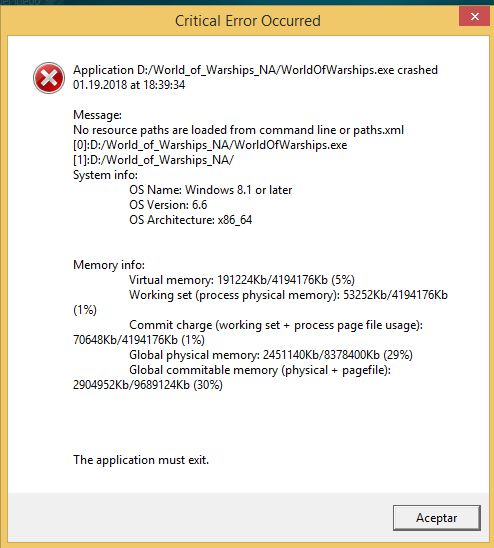 Same random error about BigWorld games client. I also have the same issue and I found this on the Wows support page, hope this helps. Since 1803 update, this game its completely unestable. Got this error in a middle of a push, still raging right now. I am having a similar problem, except when the port is initially loading, it crashed my whole pc, and have to restart it. I haven't successfully loaded into the port in a few days, despite some system settings being tweaked. 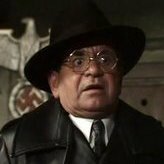 WOT and WT work fine. In all other ways my system performs normally.